A Day at the Beach ! Want to lose elasticity,get more wrinkles,drier skin,sunspots,red splotches uneven skin tone and MAYBE get skin cancer…then you need to use it even more. 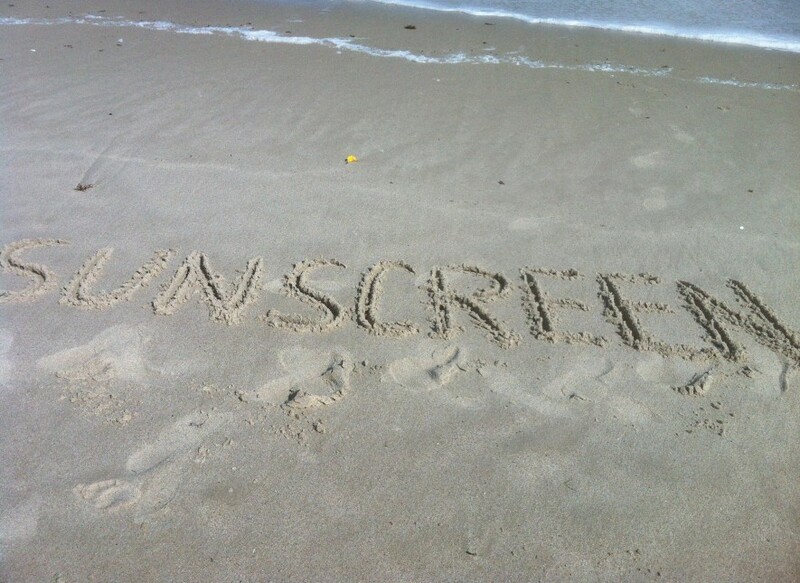 This month is Skin Cancer Melanoma Awareness month. Be street smart! Be sun smart be careful guys and gals. As much as I love the sun and sunshine rays you need to be aware and BEWARE. A day at the beach,riding a bike or taking a hike ALL need your TLC and skin love. Your skin does a lot for you…LOVE it back! Day 24 to more beautiful skin! Sun spots according to most women and men aren’t very pretty. Days in the sun,pregnancy or prescription medicine can give those little or big brown spots and splotches. In the Orient women dislike them so much they get skin whitening facials to eliminate them and to lighten the skin. The bright news is you can fade those spots over time. The magic ingredient is Hydroquinone,and should be dabbed directly onto brOwn spots every night.I have one pesky spot on my upper right cheek and I use this nightly. I do not apply it right before I go to sleep, I apply it an hour before after I have washed my face and give it a chance to do its magic to help lighten my spot. This way I don’t rub my face into my pillow case and the cream is gone. I recommend this cream to all my clients who are concerned about this spotty issue. See a dermatologist for this remedy for spot beauty or your spa. You’ll look awesome before you know it! You’ve got beauty questions I’ve got answers! As I told you yesterday I answered some beauty questions on TV this time instead of doing a segment doing makeup or skin care secrets on a model. Sometimes the TV station comes to you but most of the time we go there. Hope these questions and the answers to them help you with a question you’ve been wanting to know about. What do I do that is more natural home remedy for stretch marks besides cocoa butter? Stretch marks from a makeup artists point of view…are softened with Jojoba it is not really an oil but what they call a liquid ester. I have heard from clients my recommendation in using Jojoba and rubbing it on gently and daily on stretch marks will soften the appearance of them. If you want to cover them up try a product called Dermablend..it covers a multitude of sins from tattoos to minimizing the look of stretch marks. How do I put false eyelashes on without losing my mind? Lashes love them or hate false eyelashes…Here is what to do. TRY a demi- strip like half a lash instead of a full strip.This will be a bit easier to apply. I too have my challenges with them and use them ONLY on special occasions not everyday. Best product for Brown spots? Retin- A is the key ingredient and cream to apply for tired looking skin and on sunspots. Your skin may be irritated at first but so worth it. If you bake in the sun they will come back. If you are careful and use it wisely and NOT bake your spots will fade or tone down in their appearance. What do I do with old lipsticks that have melted, broken or have been discontinued?